Lubrication system is one of the important need in all types of machines. As with time degradation, wear-tear of the machine takes place So, Lubrication plays a very important role. All the machines are designed with a fully functioning efficient lubrication system. Generally, old machines had the provision of doing Lubrication manually. But the manual lubrication of each and every part of machine consumes very precious time and also production loss. So here we will discuss the Automatic Lubrication System Functioning. Automatic Lubrication system consists of a PLC and HMI. The hardware part comprising of the Solenoid valve and Lubricant holder should be kept at proper places in the machine. 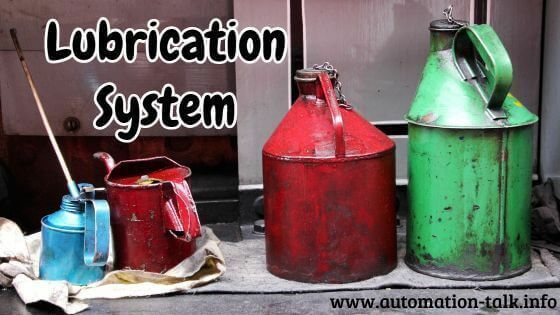 As in machines it is required that the lubrication system should run for a fixed interval of time and then stops and then gain starts automatically as defined by the time in HMI and each lubrication system should run Sequentially.Subscribe to Automation-Talk by Email . As in this system, first of all, RUN TIME and STOP TIME of each lubrication system is input through HMI and read on PLC. Machine Operator can set the time accordingly and change as required. There is also one auto-manual selector switch provided in the panel and operator can operate the solenoid valve in manual mode to check the functioning of each Lubrication system. Relays will be used to actuate the solenoid valves. Here we are taking the example of a control panel consisting of three lubrication system and one HMI. First of all, RUN TIME and STOP TIME for each lubrication system will be entered from HMI and whenever the panel is turned ON for the first time each lubrication system will run for the time specified in HMI sequentially one by one and after that they will stop for the time mentioned in HMI and then after that they again run and so on. Here we have considered as 1 input and 3 outputs. Logic is made accordingly as the concept defined above. You can download the PLC program below. We have also posted article on the HMI program for lubrication system, so do check it out. If you have any difficulty in understanding the logic or want to add some extra features do write us in the comment section and we will try to help you. Subscribe to Automation-Talk by Email for more such tutorials.